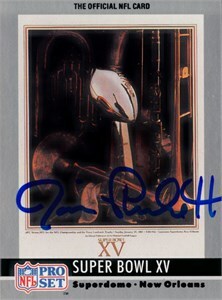 1989 Pro Set Super Bowl 15 logo card autographed by Oakland Raiders quarterback Jim Plunkett, the game's Most Valuable Player. Obtained in person. With certificate of authenticity from AutographsForSale.com. ONLY ONE AVAILABLE FOR SALE.